Aside from the modified Edge Sport and F-150, Ford will bring eight custom Mustangs at the 2015 Specialty Equipment Market Association (SEMA) show in Las Vegas next month. According to Ford, they will exhibit a diverse collection of Mustangs that will feature modified versions of the 2.3-liter EcoBoost engine. 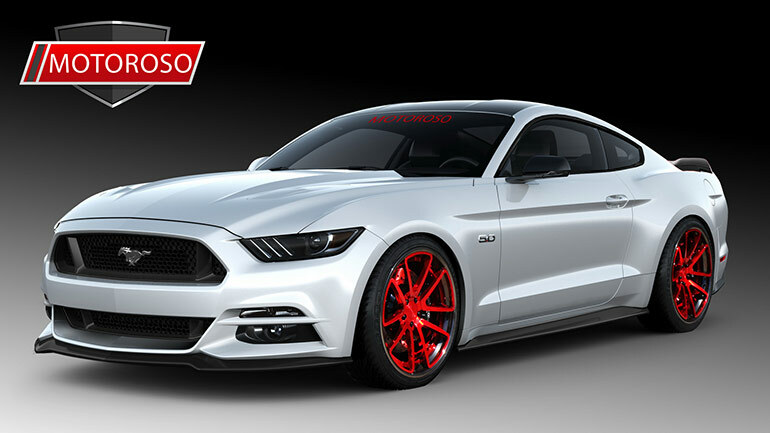 First up, Ford will display a Mustang built by Bisimoto, equipped with a 913 PS 2.3-liter EcoBoost engine. The American automaker says Bisimoto added 14 new parts for the engine and chassis of their SEMA-bound Mustang. The new parts include parts such as Turbonetics BTX7668 turbo with internal wastegate; Five O Motorsport 2200cc fuel injectors; Custom exhaust system; NGK Iridium spark plugs; Custom air intake; among others. Aesthetically, Bisimoto’s Mustang comes with a custom body kit, a black exterior paint and it is finished off with 19-inch wheels. 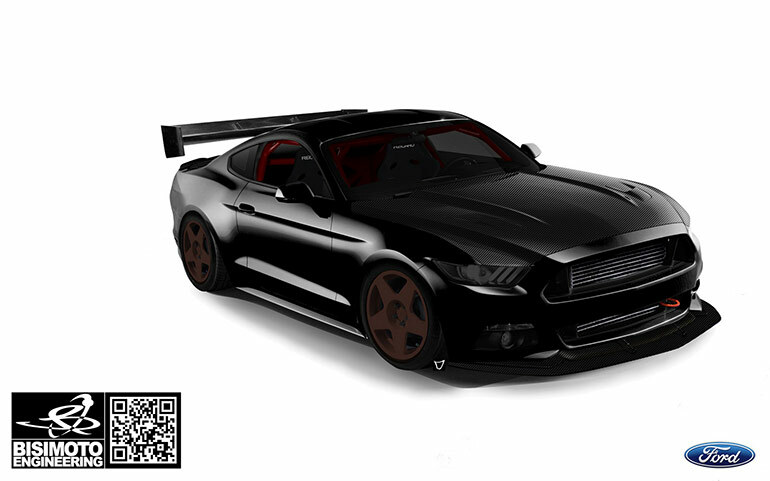 The Ford Mustang GT by Motoroso features a supercharged 5.0-liter V8 engine that delivers 737 PS. It sits on 21-inch ‘red candy’ Rotiform SPF wheels as well as an Eibach spring kit. The trunk is fitted with a custom lid that has multiple iPads which can allow the people to know more about the vehicle. The vehicle also has an aggressive front bumper, sideskirts, rear lower skirt, spoiler and hood scoop. Ford adds that the Mustang GT by Motoroso comes with Roush Performance hood vents and PIAA Terra LED evolution lighting. TS Designs worked on the Mustang convertible which gave the vehicle a wide rear. Through this, the vehicle gets a massive 13-inch wide rear tires. In addition, the wide rear tires comes with the Steeda Autosports Stage 3 handling package and lowering springs. 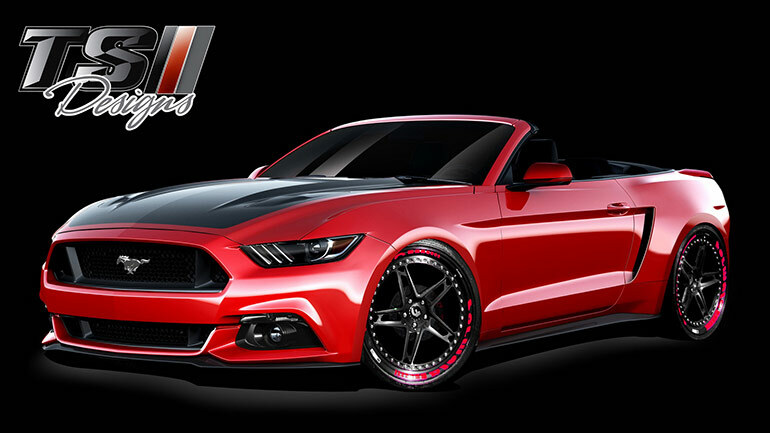 This Mustang convertible is features a red and black two-tone theme as well as a custom widebody by TS Designs. 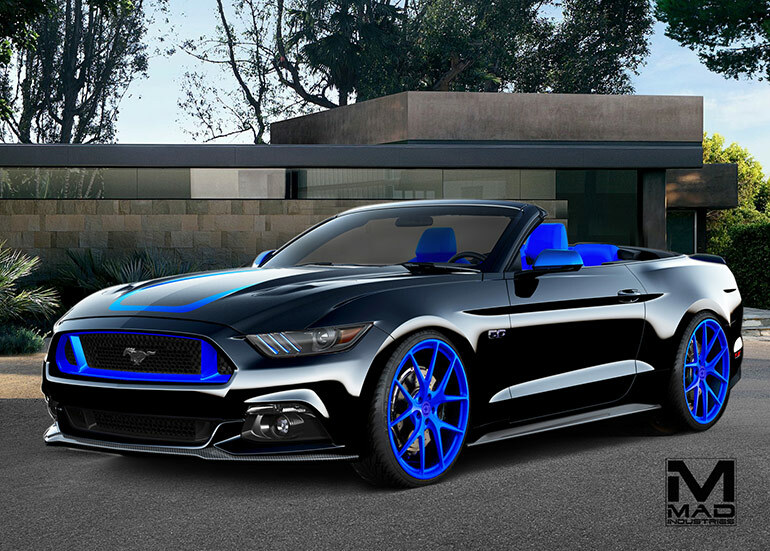 MAD Industries gave the Mustang GT convertible a pure black with brilliant blue contrast paint scheme in order to have a striking appearance. It is finished off with brilliant blue 21-inch MHT wheels. Ford says MAD’s Mustang is powered by a 5.0-liter V8 engine that produces 735 PS. Inspired by DTM Touring car series and the all-new Shelby GT350R, the Ice Nine Group tweaked this EcoBoost-powered Mustang to generate 482 PS. Ford says this Mustang features a heavily-tuned powertrain that is highlighted by a Garrett GTX3076R turbo, Corsa prototype exhaust system, custom downpipe and custom tuning by Dead Hook Motorsports. It also has an air lift performance air suspension along with a six-point roll cage. 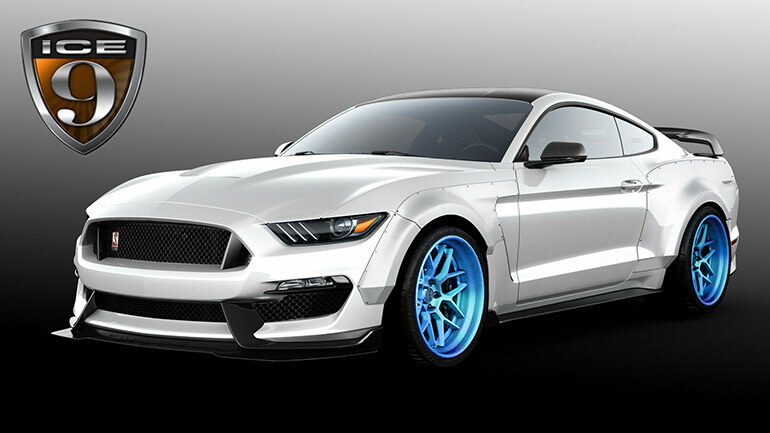 The Mustang by Ice Nine Group is finished off with 20-inch wheels. 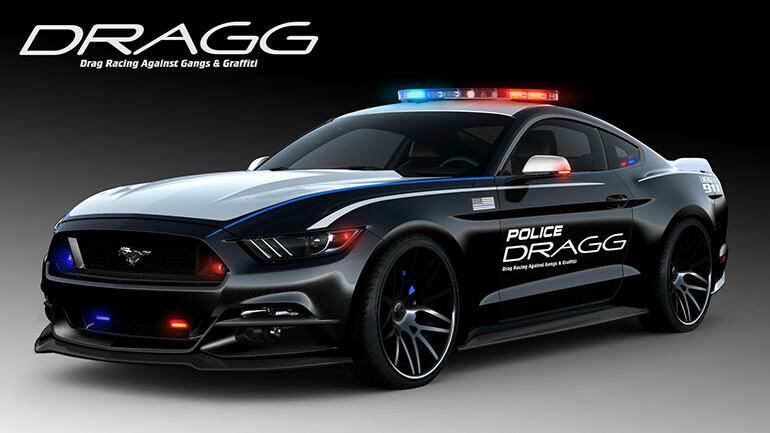 It has a custom police lighting as well as a “Thin Blue Line” stripe by JN Designs. Powertrain modifications equipped to the vehicle are the following – Vortech Engineering intercooler system; Borla “Attack” cat-back exhaust system; AIRAID intake by American Muscle; BAMA tuning by American Muscle; and TruFiber carbon fiber fuse box and radiator support covers. 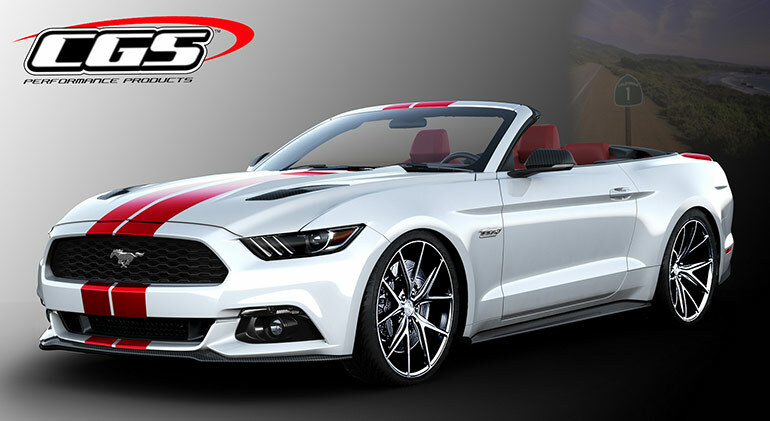 CGS’ Mustang convertible rides on custom forged 21-inch front and 22-inch rear wheels. Ford explains that this SEMA-bound Mustang is a “relative sleeper among the wild concepts.” The American automaker says this Mustang features a throaty exhaust and other powertrain mods. 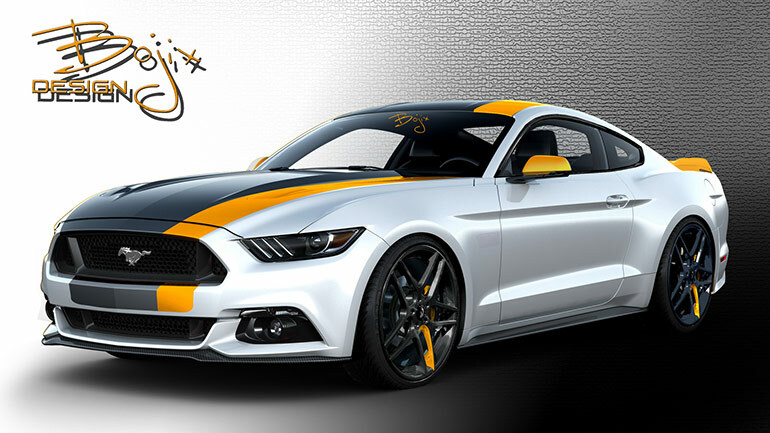 Lastly, Bojix Design’s Mustang intends to bring a distinctly European grand tourer feel with an aggressively refined exterior paint theme. This Mustang includes a number of powertrain and chassis modifications such as a custom exhaust system, a turbo upgrade, a tweaked intercooler as well as an Eibach front and rear sway bars.